Tam Bam, both pieces are very nice. Your plate really pops, and, yes, I found the "M". (Wish I had found one on mine.) I also noted the label. Your pendant is beautiful! Do you wear it often? you can't imagine how many of these plates I sold between between the 1995 and the 2000! I can tell you some name of the possible producers: Ragazzi, Tiozzo, Trevisan, Mosaico Veneziano. Moretti, with his name and history, is on an higher price range and they sell a lot less in quantity. For this style of multicolor murrina composition, they use standard murrina canes, that they can buy just ready cutted in small pieces to be use immediately. Therefore for these plates is very hard to say who is the company, due to the murrinas are the same. May be that you can check the finishing (coldwork). Probably the Tiozzo ones are more "hand finished" (Claudio Tiozzo is a very good coldworker), the Ragazzi and Trevistan ones are really similar, and the Mosaico Veneziano productions are a little cheaper. There are also other companies, but these four names had the 80% of the market for these productions during the last 15 years and they are still in production. PS. Ragazzi and Trevisan in the last 7-8 years should feature the official "Murano mark". I'm not sure if Tiozzo is in the consortium and for sure Mosaico Veneziano is not. I appreciate your help with this little plate. May I ask, please, the terms to use when describing "coldwork"? What do I look for to determine better or lesser quality? with coldwork I mean all the different works on cold glass (like engraving, polishing, cutting, sandblasting...). This piece was made by fusion of a composition of several small glass pieces on an electric kiln. Doing this you will have a flat and clean surface on the top side and a rough surface on the lower side. As you can see on your plate the two sides features instead a similar level of opacity and finishing. This is due to they are "coldworked". I can't be sure at 100%, but this finshing was made by a polishing tape and a polishing wheel passing the plate on. On the lower rough side it will clean it, on the upper side it will glaze it, up to have the same level of translucent effect. Also Ercole Moretti uses a small murrine (usually clear) with an "M". *from that link* this plate has Moretti's trademark "M" within the glass showing its authenticity. Honestly... if the Chinese can counterfeit microscopic security threads placed in collectable USA banknotes, does anyone really believe the 'M' detail is a proof of authenticity? Sorry, to me, that just stood out as way too optimistic and if your interested in rooting out forgeries you won't deny it. I've very little investment in what's called 'Murano'... but those with more have more to loose when consumer confidence suffers due to fakes and the scammers out there. This is the only example I have of this type of tiny plate. It was purchased new retail in Sydney - Australia back in 2005. I suspect there were millions of these made for a Global market. The pic was taken for a shipping manifest when I moved to WA from Sydney, so not all that focused on specific detail. Feel free to copy and archive on this site if you wish. Haven't resized image so thats not an active link. There was a time I sought a much larger specimen of this type work [ie. diameter of 250mm], but now it all seems like mass production work to me. My focus is on genuine old cameo glass and works of a specific Aus glass artist. Sorry, to me, that just stood out as way too optimistic and if your interested in rooting out forgeries you won't deny it. (...)fakes and the scammers out there. True. It is easy to make a small murrina with an "M" inside. An "entry level" lampworker can do a small cane with the M inside in 10 minutes. But if you check on the other image the code on on the Murano mark is 003 and it is the code of Moretti factory. I appreciate your instruction about what coldwork is in the glass world and how my little plate was made! You are correct, the plate looks and feels the same on both sides. These little plates appear to be very popular and affordable gifts and souvenirs which were made by many different glasshouses, some of which do not have a "signature". I will be sure to look at web sites for the names you have given me as well as your own gallery site (which will be very pleasing to do.) Once again, your help is very much appreciated as are the photos you sent as well. Alex is very correct that 003 is Ercole Moretti's Promovetro number. Here is the box that my little plate came in. I wonder if your plate could made by Vinciprova Vetri di Murano. 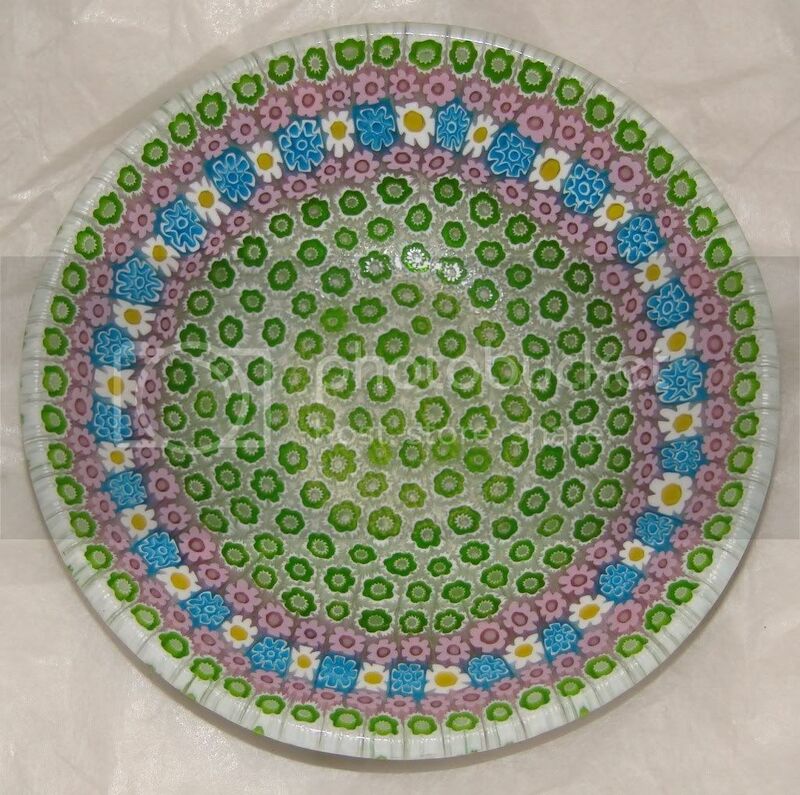 I found this plate on Ebay today and this particular company also makes miniture millefiori dishes. This company also makes a pair of miniture vases that I own (mystery solved regarding my vases).